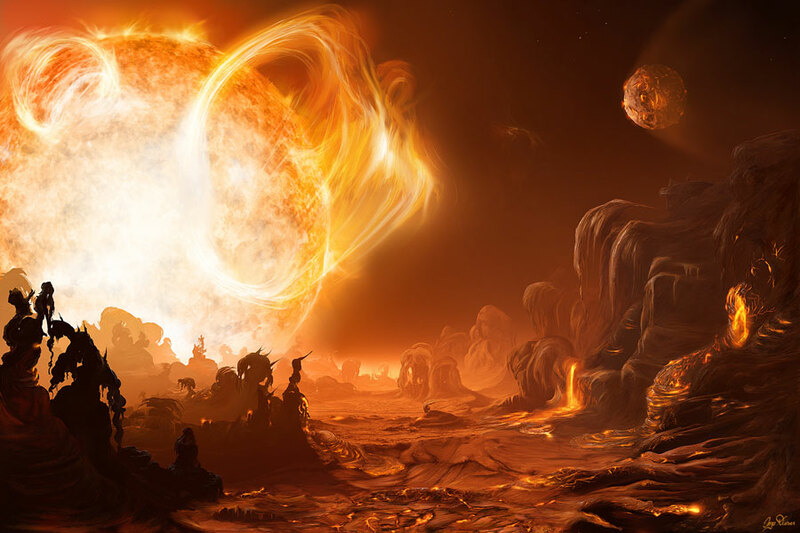 Ok, apparently I am a sucker for artist’s renditions of active red dwarfs. Today’s picture is the Astronomy Picture of the Day, and shows a concept of what the surface of Gliese876d might look like. This planet is heftier than Earth and orbits closer to its star than Mercury does the sun. However, it orbits a dim red dwarf, which means that even though it is close to the star, it is in the habitable zone and liquid water might exist on the surface. Unfortunately, its close proximity to the star also may mean that it experiences some wicked tides, and may spin extremely slowly. In fact, it is possible that the planet is tidally locked to the star, just like the moon is with the Earth. This would mean that on one side of the planet it would always be daytime and the other side would always be night. Believe it or not, even a planet with one side constantly scorched and the other frozen in darkness might be habitable, but the sun would never rise or set. It would just hang there, angry in the sky. This entry was posted on May 21, 2008 at 2:20 pm and is filed under Not Mars, Pictures. You can subscribe via RSS 2.0 feed to this post's comments. Both comments and pings are currently closed. Even if there were a habitable zone on a tidally locked planet, i think there would be tough steady winds blowing between the hot and cool regions (similar to what happens on earth between the equator and the mediterranean/subtropical belt. the heated atmosphere at the sunward side would rise up, while falling back on the cold side. thus a strong wind blows from hot to cold at high altitudes, and back from cold to hot on low altitudes (i.e., right above ground). Wouldn’t a tidally-locked planet be more habitable than a very slowly rotating one? A tidally locked planet would have a belt of moderate temperatures in permanent sunshine, perfect for plant life, while a slowly rotating planet would mean that plants have to “hibernate” for potentially days at a time, possibly in extremely cold temperatures. Matthias: Yes, the weather on a tidally locked planet would be pretty interesting. I’ve tried to wrap my brain around it, but beyond the hot/cool circulation that you describe, I am not sure what weather patterns would be like. One important aspect is that there would be very little Coriolis force, so no hurricanes, etc. Santiago: Yes, you may be right. And if the tidally locked planet had oceans, I bet they would moderate the temperature enough for the habitable bealt to be somewhat wider.